The materiality of gallows’ sites and the apparatus of execution had their own magical and medical afterlife, inextricably linked with, yet ultimately independent of, the executed criminal. This chapter includes discussion on European gallows traditions, English legends of providential strangulation, and the trade in and lore of the gallows mandrake. It then focuses on the trade in hanging ropes in Europe and America, and the relationship between mementos and magical talismans. We move now from matters concerning the identity and potency of criminal bodies to their post-mortem relationship with the immediate physical environment where their last sentient moments were extinguished and witnessed. The materiality of gallows sites and the apparatus of execution have their own magical and medical afterlife, inextricably linked with, yet ultimately independent of, the executed criminal. During the eighteenth and nineteenth centuries, execution sites across Western Europe were increasingly situated in fixed locations, with those sentenced for capital offences being condemned to die ‘at the usual place’. There had always been a mix of urban and rural gallows, of course, but the process of state-building led to centralised control over the act of execution as punishment and spectacle. It also led to the closer spatial association of gallows with judicial institutions, such as jails, rather than with the communities in which the crimes took place or where the condemned criminals lived. 1 There are, of course, exceptions and anomalies. In England , between 1720 and 1830, nearly 200 people were hanged on specially erected scaffolds near the scene of their crime, quite often on remote hilltops. 2 Their purpose was to act as exceptional spectacular warnings—particularly to rioters—and to spread the message of law and order in often isolated rural areas. Writing in the 1890s, the observant Cumbrian antiquarian, Henry Swainson Cowper , mentioned the folklore surrounding Gibbet Moss, near the Lake District town of Hawkshead. The poet, Wordsworth, recalled seeing the gibbet post still standing there as a boy. As recorded in the parish register, it was that which bore the body of Thomas Lancaster , who was executed in 1672 for poisoning his family. He was hanged in front of his home and then his corpse was taken away to be hanged in chains on the spot that came to be known later as Gibbet Moss. 10 As Cowper noted, ‘The simplest form of haunt is simply that in which a particular place bears a bad reputation without there being attached to it any distinct apparition.’ Other than its bad reputation and name, Cowper thought ‘probably there are now many people who are unaware that a gibbet ever stood here.’ This seems to be the case for most haunted gibbets recorded in the late nineteenth and early twentieth centuries. The post long gone, the name of the executed usually forgotten in local lore, no one could visualise what he might look like: but there remained an unsettling presence. The gallows and gibbet from which swung the corpse of Thomas Colley , executed for the drowning of a suspected witch in 1751, were haunted by a black dog. Colley was tried in Hertford, but he was executed and gibbeted thirty miles away at Gubblecote Cross, which was a crossroads near where the fatal swimming occurred at Marston Mere. The execution and gibbeting did not take place at the crime scene, because the locals successfully petitioned against it. 11 Just over a century later, the local schoolmaster claimed to have seen the demonic dog when returning home one night in his gig. ‘When we came near the spot, where a portion of the gibbet had lately stood, we saw on the bank of the roadside … a flame of fire as large as a man’s hat … I then saw an immense black dog lying on the road just in front of our horse … The dog was the strangest looking creature I ever beheld.’ 12 The association of animal spirits with humans who died a violent or tragic death, such as the executed and suicides, was widespread in folk tradition. 13 We will return to this in the next chapter. The fact that the same legend was attributed to different stones around the country was remarked upon in the late nineteenth century, and was given further attention in the 1920s by the influential archaeologist, O.G.S. Crawford , who compiled a brief gazetteer of sites. 16 Crawford mused on the possible medieval origin of the hangman’s stone, being so named from being parish or hundred boundary stones near a gibbet or execution site. The strangled sheep-thief story occurred much later to explain the name at a time when the execution site had long fallen out of public memory. Leslie Grinsell expanded on Crawford’s list of sites, and, as far as it is possible to date, charted the chronology of the tradition. He found a couple of seventeenth-century references, but the rest dated from the mid-eighteenth century, the bulk being from the 1830s onwards. This dating only concerns the first literary references to the tradition of the various sites, of course, and does not necessarily reflect the age of the tradition in oral circulation. How this ‘migratory legend’, as folklorists call it, became so widespread is difficult to pin down. The legend clearly relates to the fable, ‘ Poena sequens’ or ‘Punishment following ’, which appeared in sixteenth-century emblem books. A woodcut of a thief, being strangled by the tied legs of the pig carcass he has just stolen as he lies down to rest against a balustrade, is first depicted in Johannes Sambucus’s Emblemata (Antwerp 1564). This was a book of images and associated moralistic epigrams that Sambucus intended ‘to instruct and to delight’. 17 It was soon translated into French, Dutch and English, and reprinted in other books of emblems. It first appears in English in Geoffrey Whitney’s A Choice of Emblemes (1586), though in his version the thief is carrying a sack of meat stolen from a shambles. That whiles he slept, the weighte did stoppe his winde. Yet soone, or late, the Lorde in justice strikes. Did Sambucus take his story from a widespread European legend circulating in oral form? Or was it his literary invention that then, rather like some fairy tales, found its way from the page and into English oral folk tradition? A search through English ballads that might have borrowed Whitney’s verse, and thereby disseminated the legend, did not turn up any examples. The divine nature of the sheep thief’s demise was suggested in one of the earliest versions of the legend associated with the Hanging Stone near Combe Martin, Devon. Referring to it, Thomas Fuller opined in the 1660s that ‘it appeareth rather a Providence, than a Casualty; in the just execution of a Malefactor’. 20 The providential aspect of John of Oxley’s demise is certainly inferred in the poem above. The death penalty for sheep stealing was repealed in 1832, and it has been suggested the nineteenth-century ubiquity of this morality legend may have been a popular response to the ending of capital punishment for the offence, 21 or it may just be a question of source bias. The hangman’s stone tradition is best understood in the context of the broader and older tradition of divine justice or retribution being memorialised in the landscape, which was prevalent in folklore and ballads from the Reformation to the twentieth century. 22 Another example is the legend associated with various Bronze Age stone circles and standing stones, that they were sinners petrified for dancing or playing games on the Sabbath. We see, in these traditions, popular manifestations of the state’s attempt to imprint morality, justice and punishment on the landscape. That some executioners were involved in the mandrake trade—selling fake products or otherwise—is evident from a letter written in 1575 by a burger of Leipsic to his brother in Riga. His brother was experiencing a series of misfortunes: his livestock was dying mysteriously, his beer had turned sour, and so had his relations with his wife. I have, therefore, gone to those who understand such things to find what is needed, and have asked them why thou art so unlucky. They have told me that these evils proceed not from God, but from wicked people; and they know what will help thee. If though hast a mandrake and bring it into thy house, thou shalt have good fortune. So I have taken the pains, for thy sake, to go to those who have such things, and to our executioner have paid sixty-four thalers and a piece of gold drinkgelt to his servant, and this [mandrake], dear brother, I send thee. In eighteenth- and nineteenth-century France, interest in the mandrake was fuelled by the popular book of magic, Secrets merveilleux de la magie naturelle et cabalistique du Petit Albert. This included several pages on how to grow the mandragore or mandrake, and noted the belief that it brought good fortune to the possessor. The ‘author’ recalled meeting a rags-to-riches peasant, who told him how his own wealth was due to a gypsy woman who had told him how to grow a mandrake. This involved taking a bryony root, which had a human form, from the earth during the spring, when the moon was in an auspicious conjunction with Jupiter or Venus. The root then had to be trimmed and planted in a cemetery or in the grave of a dead man. Every day for a month, at sunrise, it had to be watered with the whey from cows’ milk in which three bats had been drowned. After 1 month, the root was dug up and would be found to have taken on a human likeness. It then had to be dried in an oven with the plant vervain, and finally wrapped in a piece of the burial shroud of a dead person. 33 So here we have an essential association with places of death, if not explicitly with the gallows. The Petit Albert also includes the most culturally influential recipe for creating the notorious Hand of Glory, in French known as the Main de Gloire, which is thought to be a corruption of the French for mandrake—mandragore. How the etymology arose is confused, but there is an obvious shared association with the gallows corpse. But this is vain imagining. As has already been noted, the scaffold or execution platform was a temporary construction. However, while it still stood, there was a brief opportunity to obtain part of the structure. By the mid-nineteenth century, the trade in fresh body parts was at an end across Europe, the control over the corpse having been wrested from the executioners, but in hanging countries, in particular, they still had a degree of control over the gallows and the tools of the trade, and people had long sought out pieces of the execution apparatus for medicine and magic. The most enduringly desired artefact from the execution site, and the one most controlled by the executioner, was the hanging rope. After all, it was, by custom, the hangman who paid for it from his fees. It had been much sought after for centuries for healing. Before the age of the guillotine and garrotte, the hanging rope was used in France and Spain as a cure for headaches by touching the temple with it, and pieces were kept in the pocket against toothache. In Transylvania , a piece of hangman’s rope placed in the bed was thought to prolong the life of those near death. 39 The rope, like criminal corpse body parts, was also thought to have non-medical magical properties. The inquisition tribunal records for sixteenth-century Spain contain numerous references to its use in love magic. One woman confessed before the tribunal ‘that she used rope from a hanging and carried it with her to lure men’s wills’. María Tausiet has observed ‘the symbology of subjugation linked to death by asphyxiation and embodied in the hangman’s noose, which had the ultimate control over another person’s will’. 40 In early modern Germany and in early nineteenth-century Molise, central Italy, it was thought to act as a talisman against gunshot. The most pervasive and enduring market for hanging rope through to the twentieth century was amongst gamblers of all levels of society, who prized it as a luck-bringer. 41 As with body parts, the executioner had to contend with competition for this perquisite. In one early modern German instance, a robber, named Hörnlein, was prosecuted for having stolen a piece of rope from the gallows in broad daylight. 42 There was no doubt a trade in fake pieces of rope as well. After scouring the folklore archives, the eminent American folklorist, Wayland Hand, was led to conclude that the use of the hanging rope as a cure was rare in America, and largely limited to Anglo-Americans and German-Americans in Pennsylvania and Ohio. Use of parts of the scaffold was equally scarce. He suggested that the lack of data on both traditions was a result of the ‘rarity of hanging at a time when folklorists, local historians, and other antiquarians came on the scene to report such happenings’. 73 Public hangings had largely ended in the north-eastern states by the mid-nineteenth century, and most of the southern states by the end of the century. Arkansas continued to conduct public hangings for rapists into the early twentieth century, while Georgia and Mississippi briefly re-authorised public hanging around 1900, but as states turned to the electric chair, the noose was increasingly abandoned. Kentucky was the last to continue public hangings into the 1930s. 74 The abolition of public execution was not straightforward. Numerous hangings continued in semi-public spaces, or in jail yards, where the number of invited guests seems to have been quite considerable sometimes. Neither was solemn, respectful behaviour guaranteed, with some reports describing the selected witnesses behaving like a ‘mob’. 75 So there were opportunities to obtain hanging rope into the early twentieth century, when folklore collecting was thriving. As Hand suggested, searches of other sources, such as diaries, police records and ‘rare local histories’, might prove helpful to clarifying the practices of execution healing and magic. The Online Archive of American Folk Medicine, for example, reveals that the curative hanging rope tradition for fits and warts was also known in Maryland and Indiana. 76 The digitisation of newspaper reports helps the research into this tradition. 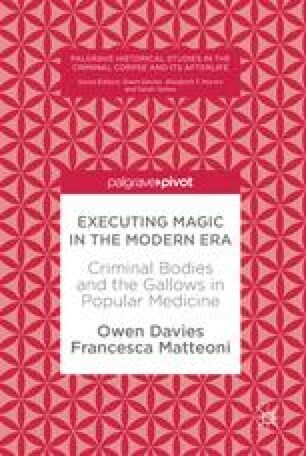 Such reports confirm that the belief and usage of the gallows rope in popular medicine and magic was much more widespread than the folklore sources suggest. This is not really surprising, considering how widespread the demand for rope was in Europe at the same time. There was a tendency in the American press to assume that European-Americans were less ‘superstitious’ than their European cousins, and hence, perhaps, the regular reporting of hanging rope selling as part of the souvenir trade. How do we know, though, that these items were desired solely as macabre souvenirs? How many of these ‘memento fiends’ were actually acquiring them for magical and medical means? The Civil War was only a few decades on from the German reports of people taking fingers and other parts from the criminal corpses displayed on the wheel, and there were many ethnic German soldiers in the Civil War armies. 88 In England, the tradition of cramp bones kept in the pocket or under the pillow was widespread. While in most English folklore sources cramp bones were from the patella or knucklebone of a sheep or hare, one antiquarian noted in the early nineteenth century that he had ‘heard that some of strong nerve, resolving to prevent the approach of so unwelcome an assailant as the cramp, have been known so temerarious as to wear the more potent spell of a human patella.’ 89 We also need to bear in mind that mementos and souvenirs could accrue amulet-like power as they passed through different owners’ hands over the years. Likewise, a piece of rope purchased for luck could, decades later, have no meaning other than as a historic curiosity, the motivation of its original owner completely lost to history. See Spierenburg, The Spectacle of Suffering, ch. 3. Steve Poole, ‘“For the benefit of example”: Crime scene executions in England, 1720–1830’, in Richard Ward (ed.) A Global History of Execution and the Criminal Corpse (Basingstoke, 2015), pp. 71–102. For examples in Scotland, see Rachel Bennett, Capital Punishment and the Criminal Corpse in Scotland 1740 to 1834, forthcoming. Jorris Coolen, ‘Places of justice and awe: the topography of gibbets and gallows in medieval and early modern north-western and Central Europe’ World Archaeology 45 (2014) 767. Evans, Rituals of Retribution, pp. 225–226. The Monthly Magazine, 47 (1819) 509. Sarah Tarlow, Hung in Chains: The Golden and Ghoulish Age of the Gibbet in Britain (Basingstoke, 2016); Zoe Dyndor, ‘Gibbets in the Landscape: Locating the Criminal Corpse in Mid-Eighteenth Century England’, in Ward (ed. ), Global History of Execution, pp.102–126; Bennett, Capital Punishment and the Criminal Corpse in Scotland; Coolen, ‘Places of justice and awe’, 762–779; L. Meurkens, ‘The Late Medieval/Early Modern Reuse of Prehistoric Barrows as Execution Sites in the Southern Part of the Netherlands’, Journal of Archaeology in the Low Countries 2 (2010) 5–29; Nicola Whyte, ‘The deviant dead in the Norfolk landscape’, Landscapes 4 (2003), 24–39; Nicola Whyte, ‘The after-life of barrows: prehistoric monuments in the Norfolk landscape’, Landscape History 25 (2003) 5–16. John Field, A History of English Field Names (1993), pp. 237–239; Johannes A. Mol, ‘Gallows in Late Medieval Frisia’, in Rolf H. Bremmer Jr., Stephen Laker and Oebele Vries (ed. ), Advances in Old Frisian Philology (Amsterdam, 2007), pp. 276–277. F. Hancock, Wifela’s Combe: A history of the Parish of Wiveliscombe (Taunton, 1911), p. 253; Taunton Courier, 2 November 1921. See more generally, Owen Davies, The Haunted: A Social History of Ghosts (Basingstoke, 2007), pp. 51–54. Ethel H. Rudkin, ‘Lincolnshire Folklore’, Folklore 44 (1933) 209. Henry Swainson Cowper, Hawkshead (London, 1899), p. 326; Theresa M. Kelley, Wordsworth’s Revisionary Aesthetics (Cambridge, 1988), p. 120; A. Craig Gibson, ‘The Lakeland of Lancashire: Hawkshead Town, Church and School’, Transactions of the Historic Society of Lancashire and Cheshire N.S., 5 (1865) 147. London Morning Penny Post, 28 August 1751. ‘Spectre-Dogs’, Chambers’ Book of Days (Edinburgh, 1864), pp. 433–434. Theo Brown, ‘The Black Dog’ Folklore 69 (1958) 176, 185; Davies, The Haunted, p. 37; Bob Trubshaw, Explore Phantom Black Dogs (Loughborough, 2005); Mark Norman, Black Dog Folklore (London, 2016). Thomas Rudge, The History of the County of Gloucester: Compressed (Gloucester, 1803), Vol. 1, p. 239; Samuel Rudder, A New History of Gloucestershire (Cirencester, 1779), p. 606. Thomas Rossell Potter, The History and Antiquities of Charnwood Forest (London, 1842), p. 179. ‘Hangman’s Stone’, Manchester Weekly Times, 27 May 1898; O.G.S. Crawford, ‘Hangman’s Stones’, Notes & Queries 12 Series, xi (1922) 50-52. Malcolm Jones ‘The Hangman’s Stone and the Unwonted Fruit: Two Emblems of Folkloric Origin’, Emblematica, 5 (1991), 287–299; Arnoud S.Q. Visser, Johannes Sambucus and the Learned Image: The Use of the Emblem in Late-Renaissance Humanism (Leiden, 2005), p. xxiv. Geoffrey Whitney, A Choice of Emblemes (Leiden, 1586), p. 41. Peter King, Crime, Justice, and Discretion in England, 1740–1820 (Oxford, 2000), p. 314, n. 51. See also, John Rule, ‘The Manifold Causes of Rural Crime: Sheep-Stealing in England, c. 1740–1840’, in John Rule (ed. ), Outside the Law (Exeter, 1982), pp. 102–129. Thomas Fuller, The History of the Worthies of England (London, 1662), p. 247. Jacqueline Simpson, ‘Seeking the Lore of the Land’, Folklore 119 (2008) 133. Alexandra Walsham, Providence in Early Modern England (Oxford, 1999), pp. 97–98; Alexandra Walsham, The Reformation of the Landscape: Religion, Identity, and Memory in Early Modern Britain and Ireland (Oxford, 2011), p. 499. Charles Brewster Randolph, ‘The Mandragora of the Ancients in Folk-Lore and Medicine’, Proceedings of the American Academy of Arts and Science 40 (1905) 487–532; R.K. Harrison, ‘The Mandrake and the Ancient World’, The Evangelical Quarterly 28 (1956) 87–92; Jeannine E. Talley, ‘Runes, Mandrakes, and Gallows’, in Gerald James Larson, C. Scott Littleton and Jaan Puhvel (eds), Myth in Indo-European Antiquity (Berkeley, 1974), pp. 157–168; Marie-Françoise Notz, ‘La Mandragore merveilleuse’, Cahiers Ethnologiques 14 (1992) 129–142; Anne Van Arsdall, Helmut W. Klug and Paul Blanz, ‘The Mandrake Plant and its Legend: A New Perspective’, in Peter Bierbaumer and Helmut W. Klug (eds), Old Names—New Growth: Proceedings of the 2nd ASPNS Conference (Frankfurt, 2009), pp. 285–347. Van Arsdall, Klug and Blanz, ‘The Mandrake Plant’, p. 333. Laurent Catelan, Rare et curieux discours de la plante Mandragore (Paris 1638), pp. 3–4. Jennifer Evans, Aphrodisiacs, Fertility and Medicine in Early Modern England (Woodbridge 2014), p. 178. John Gerard, The Herball or Generall Historie of Plantes (London, 1633), p. 351. Thomas Browne, Pseudoxia Epidemica (London, 1658), Book 2, p. 107. William R. Newman, ‘The Homunculus and the Mandrake: Art Aiding Nature Versus Art Faking Nature’, in Jessica Riskin (ed. ), Genesis Redux: Essays in the History and Philosophy of Artificial Life (Chicago, 2007), pp. 123–128; William R. Newman, Promethean Ambitions: Alchemy and the Quest to Perfect Nature (…), pp. 208–217; Frederick J. Simoons, Plants of Life, Plants of Death (Wisconsin, 1998), pp. 121–127. Harrington, Faithful Executioner, p. 209. Johann Georg Keyssler, Antiquitates selectae septentrionales et Celticae (Hanover, 1720), pp. 507–509. Secrets merveilleux de la magie naturelle et cabalistique du Petit Albert (Lyon, 1752), pp. 166–168. Thierry Zarcone, ‘The Myth of the Mandrake, the “Plant-Human”’, Diogenes 52 (2005) 115–129. Rob Craig, It Came from 1957: A Critical Guide to the Year’s Science Fiction, Fantasy and Horror Films (Jefferson, 2013), pp. 51–54. Ruth A. Firor, Folkways in Thomas Hardy (Philadelphia, 1931), pp. 114–115; Edward Lovett, Magic in Modern London (Croydon, 1925), p. 74; Nottingham Evening Post, 12 June 1920. Van Gent, Magic, Body and the Self, pp. 155–156. Thomas Browne, Pseudodoxia epidemica, or, Enquiries into very many received tenents and commonly presumed truths (London, 1646), p. 272; Francis Grose, A provincial glossary, with a collection of local proverbs, and popular superstitions (London, 1787), p. 57; Per Binde, Bodies of Vital Matter: Notions of Life Force and Transcendence in Traditional Southern Italy (Gothenburg, 1999), p. 126; Brand, Observations, p. 583; Jacob Grimm, Teutonic Mythology, trans. James Steven Stallybrass (Cambridge , 2012), vol. 3, p. 1138. Strack, The Jew and Human Sacrifice, p. 75. Tausiet, Urban Magic, pp. 93, 94; Víctor Lis Quibén, La medicina popular en Galicia (Pontevedra, 1949), p. 273. Binde, Bodies of Vital Matter, p. 126; W.L. Hildburgh, ‘Notes on some Flemish Amulets and Beliefs’, Folklore 19 (1908) 204. Harrington, Faithful Executioner, p. 187. Ella M. Leather, ‘Notes on English Folklore: Herefordshire’ Folklore 27 (1916) 415. Frederick Printer Miller, Saint Pancras Past and Present: Being Historical, Traditional, and General Notes of the Parish, etc. (London, 1874), p. 42; Yorkshire Gazette, 13 September 1845; South Australian Register, 11 April 1846. Stirling Observer, 3 July 1856. Davies, Murder, Magic, Madness, p. 162. Georgetown Gazette, reprinted in the Bradford Daily Telegraph, 28 June 1871. Illustrated Police News, 3 April 1886. Neue Freie Presse, 13 February 1881; Welt Blatt, 16 February 1881. Harald Seyrl, ‘Todesstrage in Österreich (1876–1950)’, in Maria Loredana Idomir, Matthias Keuschnigg, Michael Platzer (eds), Vienna Conference on the Abolition of the Death Penalty November 2–13, 2011: Working Together towards the Universal Abolition of the Death Penalty (Vienna, 2011), pp. 28–29; Anna Ehrlich, Hexen - Mörder - Henker: Die Kriminalgeschichte Österreichs (Vienna, 2006). London Telegraph, reprinted in Derby Daily Telegraph, 30 March 1880;William Dixon Bancroft, McKinley, Garfield, Lincoln; their lives—their deeds—their deaths—with a record of notable assassinations and a history of anarchy (Chicago, 1901), p. 511. Western Daily Press, 2 May 1881. The Near East, 9 (1915) 406. Widely reported in the press, though not always accurately. See, for example, San Antonio Light, 9 August 1925; Pittsburgh Press, 18 October 1932. Cornell Daily Sun, 26 September 1924. Western Daily Press, 15 August 1911. Jacques-Barthélemy Salgues, Des erreurs et des préjugés répendus dans la société (Paris, 1910), p. 404. Camille de Mensignac, Notice sur les superstitions, dictons, proverbes, devinettes et chansons populaires du département de la Gironde (1888), p. 130; Paul Sebillot, ‘Les Pendus’, Revue des Traditions Populaires 5 (1890) 592–594. See, for example, Western Gazette, 24 April 1874. Gloucester Citizen, 11 October 1883. Illustrated Police News, 16 May 1885. Nordiska Museet Arkivet, Botemedel 3, 23499, 23503, 28905, 26013. Gloucester Echo, 7 November 1923. Anne Plumptre, A Narrative of Three Years’ Residence in France (London, 1810), vol. 3, p. 233. North Wales Times, 2 April 1898; South Wales Echo, 21 June 1899. Portsmouth Evening News, 24 May 1883. Davies, Murder, Magic, Madness, p. 153; Illustrated Life and Career of William Palmer (London, 1856), p. 113. New Castle News, 28 June 1911; Chris Woodyard, ‘Enough Rope: The Hangman’s Rope in the Press’, http://hauntedohiobooks.com/news/enough-rope-the-hangmans-rope-in-the-press/. Trenton Evening Times, 12 March 1909. Govogovitch’s death sentence was commuted on a technicality. Hand, Magical Medicine, pp. 71–72, 76. Stuart Banner, Death Penalty: An American History (Cambridge, MA, 2002), pp. 154–156. Annulla Linders, ‘The Execution Spectacle and State Legitimacy: The Changing Nature of the American Execution Audience, 1833–1937’, Law and Society Review 36 (2002), 607–656, esp. 627. Reprinted in the Wellsville Allegany County Democrat, 14 June 1882. Boston Journal, 23 June 1870. Rockingham Register, 5 January 1888. New York Times, reprinted in the Dundee Courier, 24 December 1885. New York Herald, 30 January 1879. Denver Post, 23 March 1902. Trenton Evening Times, 12 March 1909. Reno Evening Gazette, 12 July 1893. See Amy Louise Wood, Lynching and Spectacle: Witnessing Racial Violence in America, 1890–1940 (2011); Orlando Patterson, ‘Rituals of Blood: Sacrificial Murders in the Postbellum South’, Journal of Blacks in Higher Education 23 (1999) 123–127. New York Times, 8 August 1906. Simon Harrison, ‘Bones in the rebel lady’s boudoir: Ethnology, race and trophy-hunting in the American Civil War’, Journal of Material Culture 15 (2010) 385–401; Simon Harrison, Dark Trophies: Hunting and the Enemy Body in Modern War (New York, 2014), pp. 93–117. See, for example, Walter D. Kamphoefner and Wolfgang Helbich (ed. ), Germans in the Civil War: The Letters They Wrote Home, trans. Susan Carter Vogel (Chapel Hill, 2006). Roud, Superstitions, p. 119; Edward Moor, Suffolk Words and Phrases: Or, An Attempt to Collect the Lingual Localisms of that County (London, 1823), p. 90.